We're into mid-June. That call, text or visit with dad happened last weekend. These things signal summer. Some might say Memorial Day is the official start, but I grew up in North Dakota, where snow falls on Memorial Day just as often as it does on Halloween. If you haven't cleaned off the grill by Father's Day, you better help dad out and get after it. Anyway, I'm not pretending anymore. It's summer. 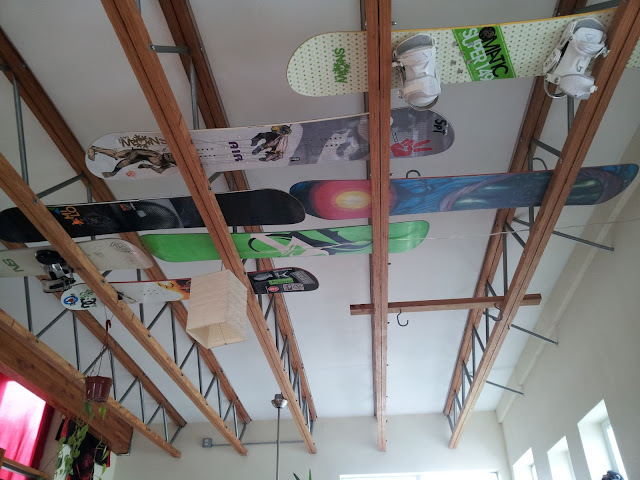 My boards are waxed and planking in the rafters. I've never gone up to Hood in the summer. This year could always be the first, but I'm more into mountain biking, running and hiking. Things I can do without the travel commitment. More and more I'm looking to skate videos for inspiration. I was e-wandering around over at Boardistan when I came upon this gem from a couple years ago. I'm not surprised that I didn't see it earlier, either. It's a skate video that came out in December. Why would I ever watch that? It is, however, everything I could ever ask for in a minute and a half of video. The whole process. Slam, banger, high fives, commentary. I could watch something like that from damn near any sport or activity. You learn more about Nyjah Huston in that minute and a half than in most full video parts. Speaking of young Mr. Huston, I remember the first time I saw him skate. It was the 2006 Dew Tour. He was 8 years old, 4 feet tall, had dreads down to his knees and was locking in ridiculous big spin hurricanes on every feature. I've never seen a kid that young and that talented. Speaking of which, Ryan Sheckler won that day. When I was 8, I was playing with Ninja Turtles, eating sand and feeding firecrackers to snakes. If only. My nieces have scooters, but are always trying to rip on my skateboard. Maybe it's time to get them their own. They live in the 'burbs. They say balance is best learned young. Just like everything, I s'pose. I WILL RIDE SANDY RIDGE AGAIN SOON IF YOU'RE DOWN FOR RIDING SANDY RIDGE SOON. I'm down. Never actually been there, but was making plans to hit it during a demo. I'm still in that 'borrow your friends' bike' phase. If you have one I can use, that'd be nice, too. Just got back from Phil's Trails down by Bend. Fun stuff down there. Camping and biking much like you wrote about. Pumping through the durt by day, stuffing full of steak, beer and marshmallows by night. The life #TM.